Just like the "real thing"! If you can't eat wheat pasta, Tinkyada is the brand to buy. The white rice pasta I bought at the store was mushy and didn't hold its shape. It was a pale imitation of the "real thing." But Tinkyada's pasta I can enjoy eating. As long as you cook according to the directions, you can't tell it's not "normal" pasta. I usually add a bit of oil to the water with the pasta to discourage sticking, because I don't do a very good job remembering to stir it! It's also brown rice-based, so it's healthier for you. One warning, if you put plain pasta in the fridge, it will be hardened when you pull it out. But, heat it with some sauce, or reheat it in a pan of water on the stove, and it's nice and soft again. I like the penne shape. It holds its shape well when cooked and doesn't fall apart. It's great for a casserole to be made ahead of time, as the pasta won't fall apart with reheating and lots of stirring. This shape is good with a smooth sauce, but I especially like it when there's something chunky mixed with it, such as diced tomato or meat chunks. Definitely recommend this brand, as well as this particular shape. 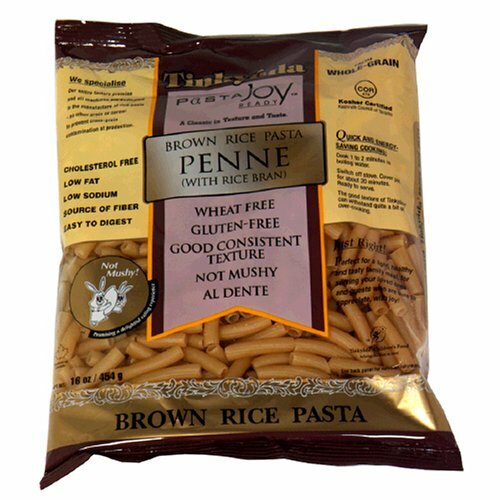 The best gluten free pasta brand I have ever tried. The texture is just like "regular" pasta. Don't overcook! I cook it for 10 minutes. The best, the best, the best!!!!!!!! Before Tinkyada came into my life I tried almost every other "pasta" that is made, they all tasted like cardboard or worse. Try this you will not be disapointed. Every gluten eating friend I have served this to could not tell the difference. Hey if you don't buy it... just leaves more for me!!! Hands down, the best GF pasta! Best rice pasta I've had. This pasta is not bad at all! 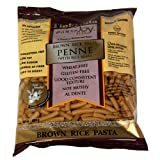 Some of my friends who tried bites of other rice pasta, all agreed they could eat this brand anytime - even in place of regular pasta. As for me, I will only buy this kind. No more from the grocery stores again.